- Saw many movies in the Siam cinema. But won't anymore. It's been torched. - Retweeting KevinRevolinski: Inglourious Basterds at the Siam. That's ominous, given how it ends for the Nazis watching the movie. 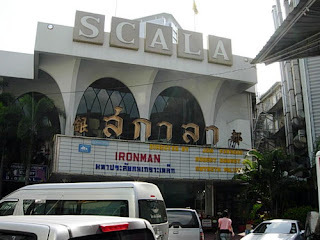 - Siam movie theatre has been collasped. - Retweeting BobThailand: Rebuilding shopping malls and movie theaters will be much easier than rebuilding Thai society after today. - Crap. Guess I can take out the contact phone number for the Siam theater on the movie page. - Re-tweeting Agam_T: the grand old classic movie theatre, Scala, set ablaze by #redshirts. Bangkok's history is disappearing before our eyes. Damn, now Lido too! - Re-tweeting veen_NT: Note: my last weet on Siam courtesy of Khun Yodyium Theptranont, an architect who considers Siam Theartre as one of Bkk historial sites. - Re-tweeting veen_NT: RIP Siam Theatre - 44 years ago the first movie screened at Siam was "Rot Tung Prachan Ban", charging only Bt7 for a front-row seat. Wise Kwai -- wisekwai on Twitter -- blogs at Thai Film Journal. Update: Wise Kwai has just posted about the destruction of the cinemas on his blog: "Siam Theatre contributed greatly to the culture of Bangkok movie-going.... an irreplaceable loss. Cinemas like that one are no longer built." The Scala, pictured here, is ok! As is the Lido triplex. But the Siam Theatre is indeed gutted. You can see photos of the destruction as well as the buildings that survived from Richard Barrow. Thank you for the update Wise Kwai. Good to hear the two theaters survived. It's great the Richard has taken these pictures. But I too find it hard to look at the photos of poor Siam. Yeah, I can't look at photos of the burned theater either. Fires are so depressing -- except for campfires.